Power users rejoice! Today we’re officially launching the ability for you to export your content as PDF and CSV on Gain. Our PDF export makes it easy to share your content with a colleague or client in an visual format. Our CSV export on the other hand, aims to make things simple when working with your content in bulk or when you want to integrate Gain’s workflow with tools like Hootsuite. Gain and Hootsuite. A new, simpler way to work. Gain plays well with any other social media tool that you might be using. In fact we designed Gain to BE hyper-focused on fixing what are often the most inefficient parts of the social media process, the planning, creating, collaborating, and approval of content to be published. Today, as part of our exporting feature launch we’re including a Hootsuite-specific export that will allow you to export content from Gain in a format that can be easily imported into your Hootsuite account using their own bulk scheduling feature! You use Gain because you want to be efficient but sometimes there are specific cases where having a more traditional approach of working is needed. Many of us have some clients that might be technophobes and want everything “in writing.” Sometimes you might need to present the content in-person and want to get approvals or revision requests right at that time. These are some of the reasons that some of you have requested the ability to export your content in way that can easily be shared with clients and shareholders. Now, exporting your content from Gain as PDF generates a beautiful visual list of all upcoming content that you can share with your clients as needed. On this new PDF export you’ll get the same pixel-perfect previews of all the content so there’s no guessing as to how the content will look when published. This is a great way to provide your clients and stakeholders a hard copy record of your work, or for compliance purposes on the client’s side. Learn more about how to export content on Gain here. Not using Gain yet? What are you waiting for waiting for? 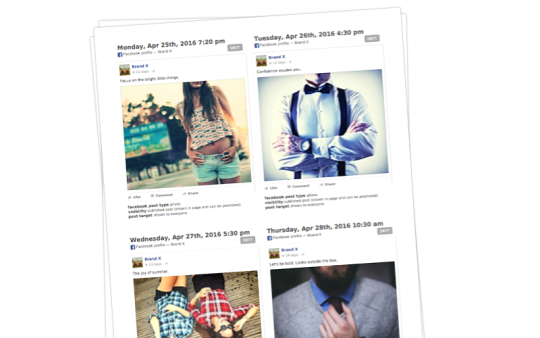 Try Gain for 14 days for free and start simplifying your social media workflow!